Our nursery is fully stocked with only the healthiest, most robust plant materials our suppliers grow. Come down to our nursery and you will experience a wide range of time-tested, well-loved favorites of the landscape world, as well as some rare and interesting plants that you may have never seen before! 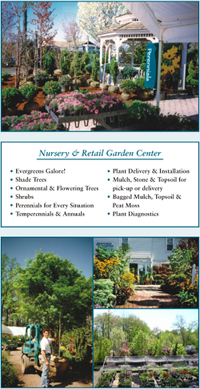 Whether you are an experienced “do-it-yourself” gardener or a beginner, our knowledgeable, enthusiastic nursery staff can help you with any planting or landscape questions you may have. Preferred Properties landscape designs have been consistent top winners at the CT Flower & Garden Show, as well as with our customers. Our experienced, professional designers are committed to working with you to put your dream design onto paper. They will also use their knowledge of plants, pavers and exterior, low voltage lighting to ensure that the physical outcome of your ideal landscape design will assimilate perfectly into your existing site. The key to a proper landscape design is not only to achieve the seamless integration of all the components as the landscape is being installed; it is also to make sure that those components will continue to work together as the landscape grows and changes over time. Our skilled, on staff masons are truly artists of their trade. Many companies will work with only modular or interlocking pavers, materials that can limit the scope of your hard-scape choices. Our masons work in natural stone, brick, granite, bluestone and virtually any other stone material you can find! They can incorporate into their stonework unique features such as graceful arches, rounded walls and metal structures such as outdoor grills, refrigerators, mailboxes or outdoor lights. Our customers have been consistently impressed with the quality and craftsmanship of our masonry and stonework. If you would like to explore different ideas for your next project, please come down to our nursery and take a look at the hundreds of jobs we have completed. Outdoor kitchens, outdoor fireplaces and built-in patio lighting are all a part of our extensive repertoire. 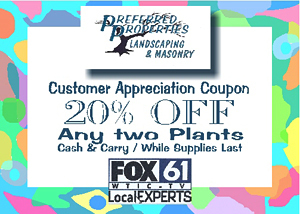 Your landscape is a living growing investment. When you invest in valuable plants, stone features, patios or walkways, these features will only remain an asset to your property in beauty and value if they are properly maintained. That’s why we offer you an annual maintenance program that can keep your plants and gardens looking their best as they grow and change with the seasons. We think it should give you peace of mind to know that the same experienced, knowledgeable people who selected the plants and shrubs and designed the beds, the people who know your landscape better than anyone else because they created it and are always looking after your investment.